To maintain high quality and reduce labor costs, Hardy fabricates duct and piping assemblies at its plant in Birmingham. With our 20,000 sq. ft. automated fabrication facility, we can meet or exceed fast-track construction schedules. We have the resources to fabricate over 3 million pounds of duct per year. 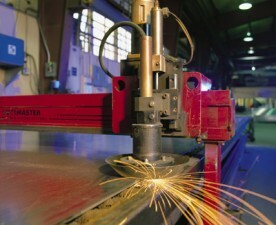 By fabricating in house, we can eliminate unnecessary costs and reduce the contract price.